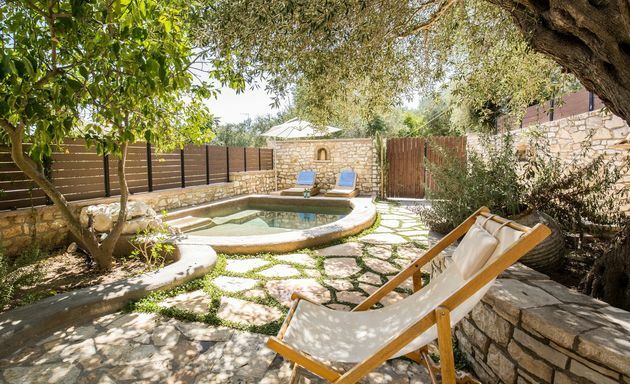 A beautiful and comfy retreat in the village of Gaios. Angelika is just a 2-minute walk away from the Gaios waterfront and has a private and peaceful garden. Due to be completed at the end of July 2017, Villa Avra already has bookings until end of August 2017 but will be available in September and the 2018 season. Villa Lila - due to be completed end of July 2017. 2 bedrooms (en suite) + sitting room sofa bed and private pool. Short walk to beaches and Lakka waterfront tavernas and shops. Available any weeks in August @ £2,300 per week. Rare to find a comfortable villa with swimming pool, magnificent views, peaceful seclusion and just a 2 minute walk to a small beach. 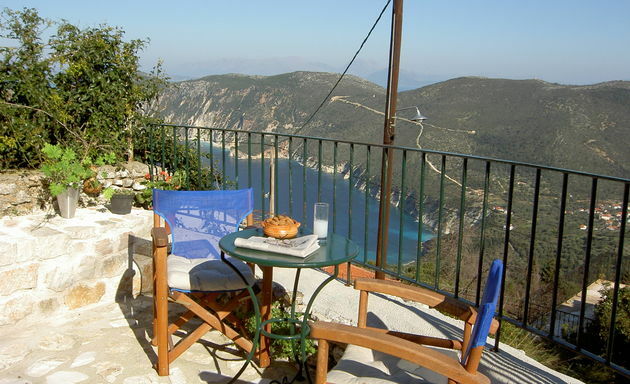 Villa Thimari overlooks Vassiliki Bay and the islands of Ithaca and Kefalonia. Close to the large sandy beaches of the west coast. Gaios is the capital village of Paxos. Gladstone came here when Paxos was a British Crown colony. Cleopatra sailed by on her way to Rome. Angelika is a stylish village house just a 2-minute stroll away from the colourful village waterfront. For those wanting to recharge batteries without disturbance. 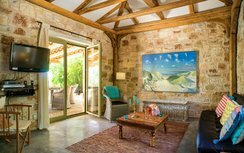 Fassoulou's Cottage commands a magnificent panoramic view over the deep blue waters of Afales Bay and Ithaca’s northern valleys of olive groves. 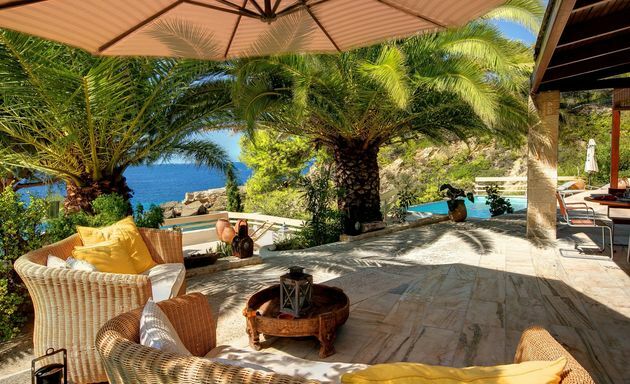 Rare to find a villa with private pool and private access to a sandy beach. Beach Villa on Kefalonia is a special find. Tavernas and shops a short distance away. The long, sandy beach of Makris Yalos just below. Beach Villa is 50 metres away from Lassi Beach House. Both villas booked together would accommodate a party of up to 18 comfortably. The Beach Villa has its own private access to the sandy beach of Makris Yalos. Villa Aspasia 19/8 - 26/8: Was £2,858 - Now £2,020. 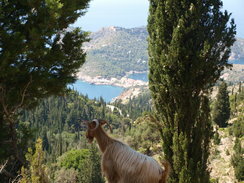 Aspasia is just a 3 minute walk south to a beautiful beach and a 10 minute walk north to Cli’s taverna above the sea. 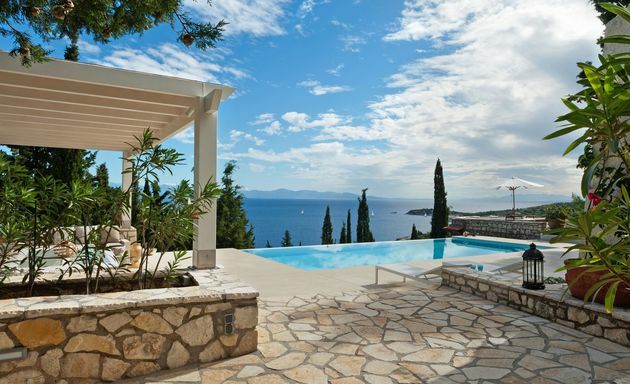 Due to cancellation - £540 price reduction for the beautiful villa "Perivoli" on Corfu for 7 days 15th to 22nd August. Was £2740 - Now £2200. 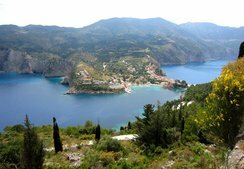 Perivoli has dramatic views over a wide plateau of olive groves, punctuated by tall cypress trees, and along the coastline towards Corfu Town. Villa Diana is just a 2 minute stroll away from an east coast beach. From the villa's terraces one can follow the slow progress of local fishing boats and the arrival of yachts and ferries from other Ionian islands. By night there is a theatre of twinkling lights from the mountain villages on the mainland. 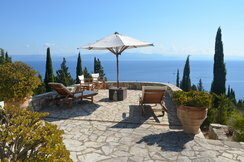 Villa Diana, on Paxos' east coast, is a 2 minute walk to a beach and has spectacular views across the sea to Corfu. Villa Chiara is surrounded by a natural landscape of olive and pine. Total privacy and only the sound of birdsong and cicada chatter. Just a 10 minute walk to the nearest beach. 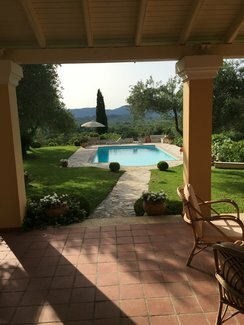 We have just taken on Villa Elia in Corfu's beautiful Ropa Valley. Elia sleeps up to 6 people and is available any July or August dates. Sonia's Apartment has just been added to our programme. A waterfront apartment for couples wanting to be just a 5 minute stroll from the colourful Fiscardo waterfront. 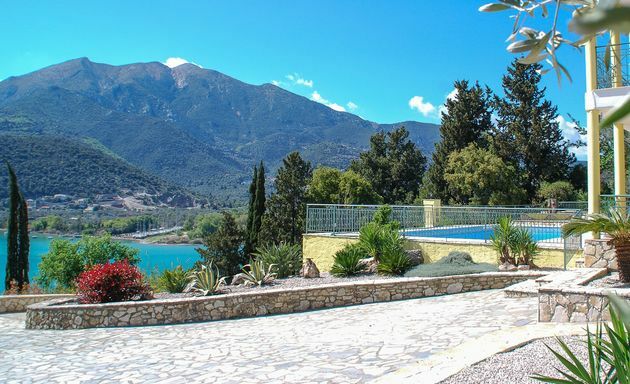 Villa Victoria on Lefkas is available 14th to 28th August. Walking distance to waterfront tavernas and a beach. Fresh bread is delivered to all the houses in Kioni, Monday to Saturday. Each householder hangs a bag on their gate containing money (one Euro per small white loaf) at night. Bread is generally delivered by 8 am. A stone can be added to the bag to prevent an Ionian breeze blowing it away. 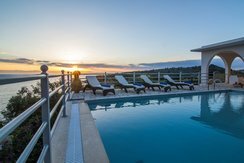 Escape the crowds this summer and hang your bread bag on the gate post of beautiful Villa Mavrouna with kioni waterfront on your doorstep. 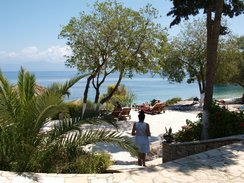 Villa Mavrouna has spectacular views across the sea to the islands of Lefkas, Atokos, Kastos and Arkoudi and the Greek mainland. 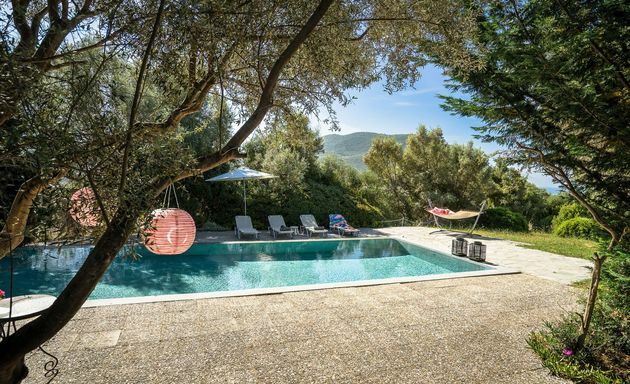 The price of a week's stay in May at Villa Elissa has been cut by 35% with a week costing £800 or just £133 pp when fully-occupied by six people. 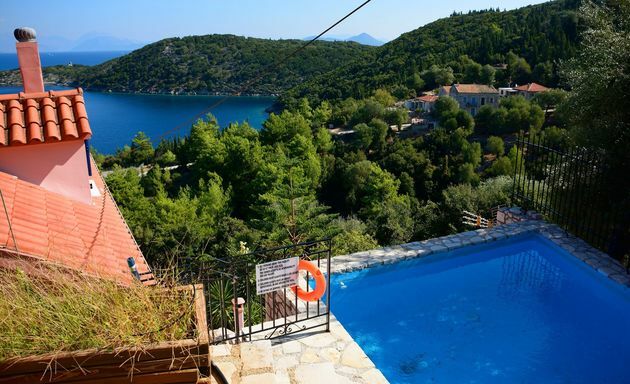 The 2-bedroomed villa has a private swimming pool and is just a ten-minute walk from the port of Lakka and a five-minute walk from three beaches and boats can be hired to explore the coast. Our winter Photo Competition was won by Debbie Marshall with her photo of Assos on Kefalonia. Debbie wins a 10% voucher against a holiday with us in 2017. Well done Debbie! 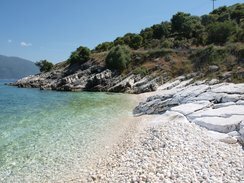 2nd prize goes to Stuart Kemble with his photo of Aetos Bay on Ithaca. 3rd prize goes to Michael Reardon with his photo of Monodendri Beach Bar on Paxos. A case of Prosecco goes to Stuart and Michael with our congratulations. 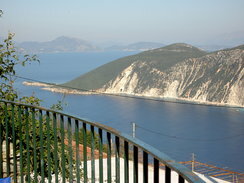 Villa Margarita on Kefalonia is still available for all of August. Strange because it is one of the plushest villas for up to 4 people above a sandy bay on the south coast. A 5 minute walk to tavernas and a minimarket. The owner is offering a 10% price reduction for any August dates so £2,740 per week reduces to £2,460. 19-Feb-2016 - Fancy a 2-Centre Holiday? Some of the Ionian islands are so close to eachother that they lend themselves to a 2-Centre Holiday. Staying 1 week on one island followed by a 2nd week on another island will allow you to experience 2 different landscapes and lifestyles and will make your 2-week holiday appear longer. Paxos is just 1 hour away from Corfu by hydrofoil. 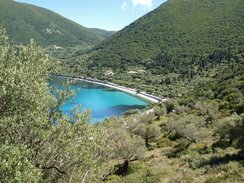 Ithaca is just 30 minutes away from Kefalonia by ferry. 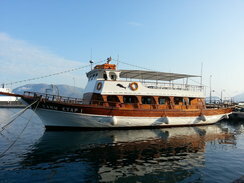 Meganissi is just 25 minutes away from Lefkas by ferry. Kefalonia is just 1 hour away from Zakynthos by ferry. AntiPaxos is just 15 minutes away from Paxos by speedboat! Or if you really want to push the boat out, we can arrange a private speedboat charter to reduce the journey time. We can give you a mix and match choice of properties on each island and arrange your inter-island transfers. 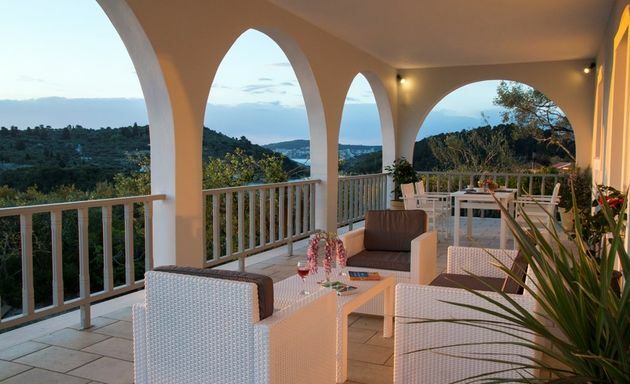 Villa Camilla is a sumptuously comfortable villa, hiding amongst olive groves on the west coast of Lefkas. The local village of Tsoukoulades has 2 tavernas, a general store and a bakery but for those who want the luxury of room service, the villa maid will lay out a daily breakfast on your villa terrace consisting of fresh orange juice, fresh crusty bread, homemade jam, honey, a selection of cheeses, a variety of sweet and savoury pastries and cakes, fresh seasonal fruits, and eggs (sorry - you have to boil these!). This page has just been introduced to give snippets of news about us, the Ionian islands and anything that might relate to Greece and your decision to plan your holiday with us. 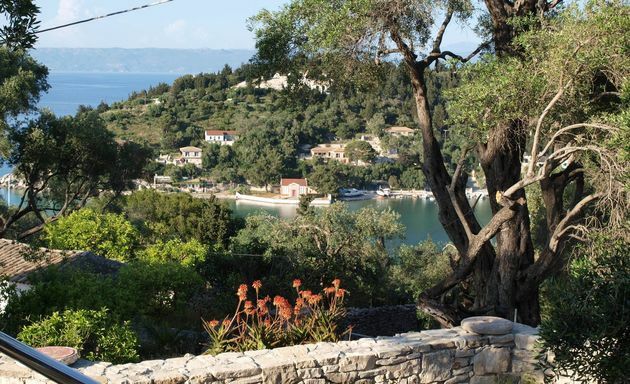 4-Feb-2016 - Paxos - May Special Offer! 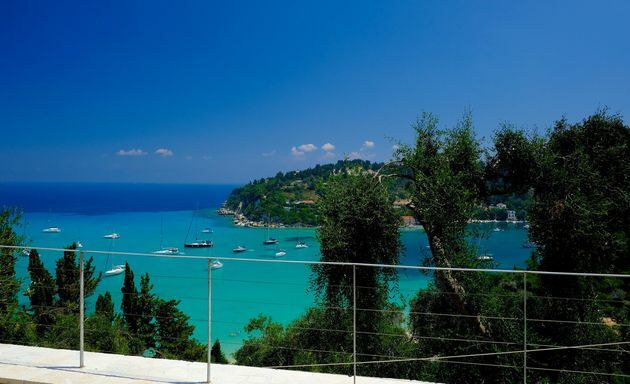 Escape the crowds and stay at Villa Elissa on Paxos with a 25% price reduction. 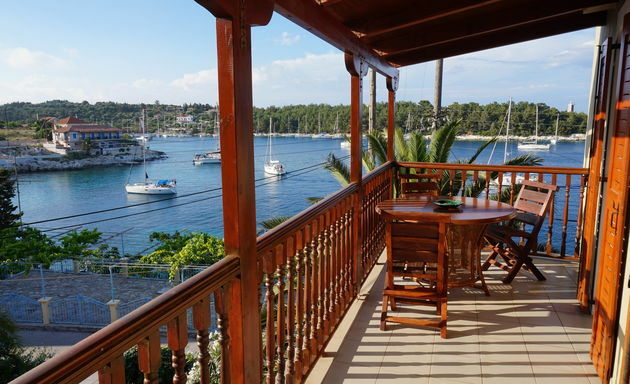 Villa Elissa (sleeps 2 - 6 people) has total privacy and is just a 10 minute walk away from a beach and the waterfront tavernas of sleepy Lakka village. Price was £1,250 - now £938 for 1 week from either 2nd or 9th May. Greek Easter Sunday is 1st May. Paxos is the perfect place to witness the Easter celebrations, staying in the small and intimate fishing village of Loggos, where you can watch the Easter procession, mix with the locals and enjoy the fireworks at midnight on the Saturday night. A week’s stay at the waterfront Mermaid Cottage, coinciding with Greek Easter, costs £600 (£300 per person). The best way to get there is by Easyjet to Corfu (approx. £110 pp) and a hydrofoil transfer to Paxos (£35 per person round trip).